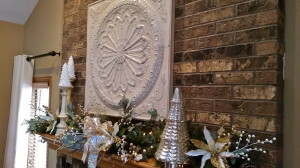 JOLLY DAY 2: MANTEL MAGIC - Decor Designs, Inc. This special time of year, aside from the Christmas tree, perhaps nothing draws more attention than the fireplace in your home. The legends of Santa Claus and stockings “hung by the chimney with care” give an almost magical allure to this year-round focal point. Along with dining table centerpieces, your mantel is an excellent opportunity to expand on the look, color palette and feel you created in your Christmas tree. 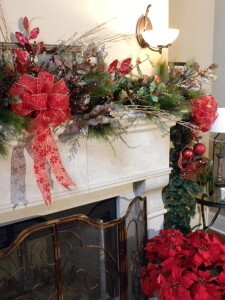 Obviously, evergreen garlands (artificial or real) are a great way to form the base of whatever mantel-scape you want to create. 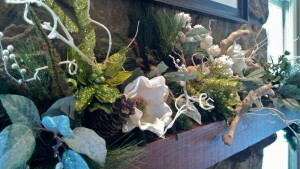 Don’t skimp on the greenery however or your mantel will make a statement and it won’t be one you want repeated. Doubling and tripling evergreens will give you a fantastic “mesh” to add picks of fruit, flowers, berries, pine cones, fruit or any other items you want to use to embellish. The dense greenery also gives you a great way to hide lighting cords and hooks for stockings. 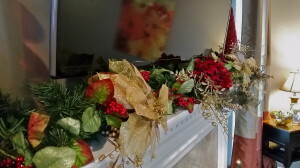 If you swag your greenery along the face of the mantel rather than laying it on the top, keep in mind the bows placed at the peaks will give the garland a “hand-tied” look and draw even more attention to the swags. No mantel? No worries, these same techniques work great on wall shelves too! After your base is in place, create focal points by nesting large decorative accessories into the greens. 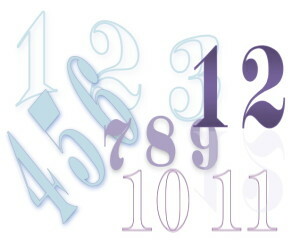 Lanterns, figurines (angels, deer, nutcrackers etc…) candlesticks and more will give height to the pine sprays. Now you can group and nest ornaments, floral picks, pine cones, fruit berries and other goodies into the bed of greens around your accessories to finish the look. Beaded garland can also be woven through or swagged and draped underneath for a very elegant look. 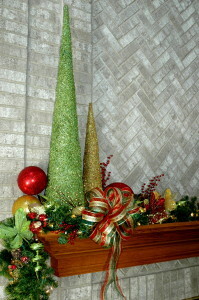 Leaving negative spaces of greenery in the garland will insure that the clusters of goodies you create will stand out. Contemporary, sophisticated, elegant or simple, don’t stop with hanging your stockings by the chimney with care. Give Santa and your guests a visual feast to enjoy this holiday season. This entry was posted in Decor Designs, Inc., Seasonal Decorating and tagged Holiday Decorating, Interior Decorating on December 14, 2014 by Jeff Rice.